Revolutionary Faith has been active for nearly three years now, and “how to feel the Holy Spirit”—or some variation thereof—is still the top search term that leads people to this blog. 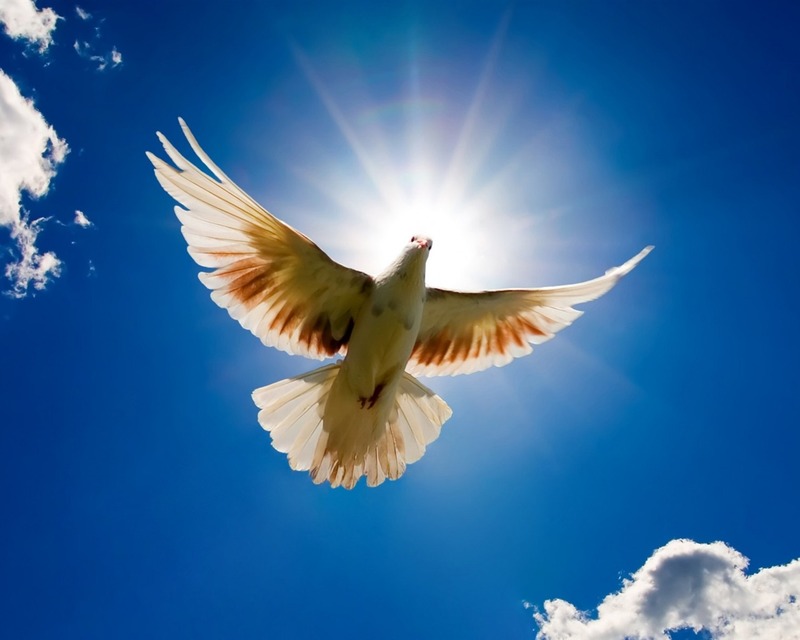 My post “What Does the Holy Spirit Feel Like?”, published in the blog’s first six weeks of existence, remains the most accessed post on the site. I understand the fascination. There is much about the Holy Spirit that remains a mystery. It is God’s powerful, dynamic presence in the Christian life, and its urgings can seem inexplicable. However, the Holy Spirit has a purpose, and I fear too many believe that purpose is simply to be felt. Many people seek the Holy Spirit for a visceral experience or spiritual vision. It exists for much more than that. In fact, if you’re having a feeling without the Holy Spirit’s other manifestations, I would pause and seriously examine exactly what it is that you’re experiencing. It may be something other than the Holy Spirit. The Holy Spirit exists to illuminate the gospel and to keep Christ’s commands at the forefront of our minds. Having trouble understanding scripture? Ask the Holy Spirit for guidance. The Holy Spirit gives believers right words to say when their faith or the gospel is challenged. Multiple times in scripture, the Holy Spirit is shown giving boldness to believers to preach the gospel. Some believers worry because they don’t feel the Spirit all of the time. Guess what? I don’t feel it all the time, either. That no longer bothers me because I understand that the Holy Spirit is much more than a feeling. It is God’s presence residing in the soul. Sometimes it is quiet; other times, it is stirred. The degree to which it is stirred depends on what God is trying to accomplish in and through me. Also, there is no one feeling attributed to the Spirit. Feelings of peace, joy and love originate from the Spirit in addition to boldness and conviction. If you are growing in the fruits and gifts of the Spirit, the Spirit is operating in you. You don’t need a particular feeling to confirm that. The problem I see in many charismatic churches is the pursuit of experience at the expense of the true work of the Spirit, which is boldness, discernment and sanctification. Ministers speak of revival in terms of a “Holy Ghost party” in which believers can see visions and become “drunk in the Spirit.” However, true revival involves spiritual renewal, not emotional bacchanal. I’ve experienced some amazing things through the Spirit, but those experiences are meaningless without the accompanying fruit. I would gladly trade a choir of singing angels for greater love and discernment in my life. We need to examine our reasons for seeking the Holy Spirit. The feelings of fire and ecstasy can bring great comfort and energy. They can also be faked. The Spirit’s purpose is to make us wiser and more effective Christians—not to get us high. Be wise in your pursuit. This entry was posted in Holy Spirit and tagged Christianity, discernment, holy spirit. Bookmark the permalink. I looked back at your discussion of what the Holy Spirit feels like and read through what you have to say here and… I’m still not sure what to say. You probably know me well enough by now to know I’m an agnostic who was raised Pentecostal, so I have certainly had many experiences with the “holy spirit”, including speaking in tongues, visions, etc. I have also been horribly abused by people claiming to be inspired by the Holy Spirit. You stated in your previous piece that the HS can give one inspiration and insight into someone else’s life and you seem to allude to that again here in #2. I know you are an anti-abuse advocate, so I am curious how you reconcile believing that god can tell you what someone else needs or wants with being against spiritual abuse? As far as I can tell, it is utterly 100% impossible for a church to hold to this belief without causing spiritual abuse. They go hand-in-hand. Anytime one person decides that god has given them a mandate or special instructions or insights regarding another person, horrible, horrible, HORRIBLE things happen. That’s what happened to me when my family believed the HS spoke to them about me (and others). I made the mistake of believing it, and I’m lucky to be alive. I guess my question is, how can you decide whether or not your “inspirations” from the HS are actually real? How can you possibly claim some secret insight to another person’s situation without risking gruesome consequences? And how can you encourage others to believe that god can give them this insight, knowing full well that abuse that this is likely to cause? I’m hoping I’m not sounding hostile here, but even just reading some of the HS doctrine is bordering on resulting in a full-on panic attack for me because, in my experience, this doctrine is just… I can’t even put in words how horrible the results can be. My body is literally shaking. Is there something I’m missing? Do you have some sort of safeguard? And would you be willing to share that safeguard prominently in any space where you discuss the HS in order to try to prevent abuse? Thanks for any answer. 1. I meditate first to be sure that the HS is really speaking. 2. I examine why the HS is giving me this insight. Does she want me to deliver a message? Or just pray about it privately? 3. I recognize that the NT gift of prophecy is primarily for encouragement and healing, not judgment or condemnation. 4. Whatever insight I receive is for that person alone. I take it to them privately, not broadcast it in front of the entire church. 5. Whatever that person decides to do with that message is up to them. It is not my business to pressure them in any direction, and I will not do it. Yes, I have seen the awful results of people who “heard from God” and then used that information to humiliate and manipulate people in the church. That’s a very ungodly thing to do and something I would not support under any circumstances. I’m so sorry this is a triggering topic for you. Please take care of yourself. I hope my answers are satisfactory. Thank you for your honest reply. I do think that these steps, if taken diligently, could prevent people from abusing their “inspirations” from god. I don’t know if you have brought this up previously somewhere in your blog, but do you think it might be worthwhile to discuss this in depth for your readers? It’s up to you, of course, since this is your space. But perhaps it would be useful. Yes, my family and church all “heard from god” regarding my sexuality, faith, and my wife (they also sometimes heard from demons). Because I believed them, I allowed them to manipulate me into submitting to abuse. I even “heard from god” myself, which resulted in me doing foolish things that I regret… things that harmed me and exacerbated the situation I was in. I do not think that anyone involved intended to be cruel or felt they were making things up. I believe my pastor’s wife, my Christian “counselor” (I know you have a LOT to say about them), my mother, my father, my sister, and myself all genuinely thought we were hearing from god and following the leading of the holy spirit. They all believed they had thoroughly “tested the spirit”, but there were no boundaries in place. In that environment, if god tells you to do something, no matter what it is, you have free reign to do it. You don’t have to consider the consequences, you don’t have to question your beliefs, you just assure yourself that it’s god and then you do what it takes. I don’t want others to fall into that theological trap. I don’t want people to take their zealousness for god and inadvertently turn it into a weapon while thinking they are wielding peace and love. It’s so seductive. Anyway, thank you again for responding and listening a little to my experience. I may not believe in god, but I am still glad there are people like you in Christianity trying to fix it from the inside, while I remain out here trying to help from the outside. I’m not sure when I’ll next get around to the topic, but I will address it. I touched on it briefly in “Heretical Ministry, or How to Make Atheists.” It’s an old post. If you haven’t read it, I recommend taking a look. Thanks for your comments. I hope you continue to heal. Galactic Explorer. What you described sounded like an analog to schizophrenia. That should have probably been your best clue. When the “Holy Spirit” is telling you to do things that sound like the things audible voices say inside the schizophrenic brain, it is not the Holy Spirit and high time for you to take a hike. Just sayin’. Wow April, right on point! Such a well-rounded presentation of who the Holy Spirit is and His purpose in our lives. I clicked-through from your exceptional Patheos piece on “deeply held religious belief”, and you’re knocking them out of the park here as well. Love it! Color me subscribed. Excellent April. I would add just one other thing about the Holy Spirit that I have heard others talk about—no supporting scriptures—and that I consider to be true from watching life. One author said that the Holy Spirit is “persistent” and “unquenchable.” He likened it unto a small, straight, natural gas flame about 3 inches high. It pops up in the corner of a room and some evil rushes over to stomp it out. The evil says, “Gotcha!! !” as the flame disappears. She then turns around, and the flame has reappeared in the opposite corner of the room. Then several hours of frustration ensue as the evil tries to stomp it out repeatedly, only to have it always reappear in another nearby location. Yeah, I know. I am a little mystic and nuts sometimes—but when the Holy Spirit is on a mission—it is going to stay on that mission until it is done, and ain’t nobody gonna stop it. It is kind of like the mummy in the old 1930s mummy movies—perhaps a little slow sometimes and certainly without the dragging foot—and it just keeps coming. I like that in the Holy Spirit!!! I guess it is akin to leaving the flock to search for the lost lamb—the shepherd is persistent and just keeps on coming until He finds the lamb. I like that in the Holy Spirit!! !